Former Turner prize winner, Antony Gormley has created some of the most ambitious and recognisable sculptural works of the past two decades, including The Angel of the North and Quantum Cloud on the river Thames in Greenwich. 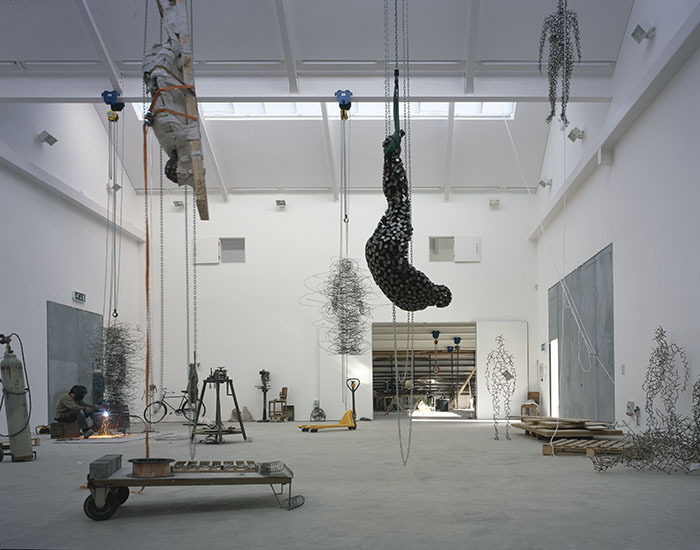 With the increasing interest in his work, Gormley required a space that would be large enough to construct his often huge installations, yet at the same time also be somewhere intimate and personal enough in which he could conceive his next artistic project. Looking to satisfy both of these requirements, David Chipperfield Architects’ design attempted to create light and open spaces for the diverse and specific ways in which Gormley works. The studio, which is located amid the industrial buildings, warehouses and rail yards just north of London’s Kings Cross station provides studio space for drawing, painting, sculpting, welding, casting, and photography. The design of the studio references and abstracts the large-scale, industrial architectural vernacular of the surrounding buildings. It is distinguished by the silhouette of its pitched roofs and its bright but even, interior light. Located to the rear of its site, the studio building itself is approached across a large yard, left open for the assembling of larger pieces. A pair of large reassuringly weighty galvanized steel staircases, with a cantilevered landing, connect the yard to the domestic-scale studio and office areas on the upper floor of the main building. The artists preference for metal is referenced throughout the project with bespoke galvanized ironmongery used throughout from the large galvanized steel windows to the even larger plate steel galvanized doors that add to the drama of the open space. Operating as both a workshop and as a pared-down, white-walled studio space, the building has become the focus for all of Gormley’s artistic production. The studio can accommodate a 40-tonne low-loader truck with 10,000 square feet of studio space and 14,000 square feet of external space. The important aspect of the design was balancing the spacial demands of scale and proportion between the main studio with its three central bays and the courtyard. Creating space for thinking and inspiration as well as the putting together. The courtyard is reinforced with 140 tonnes of steel to make it strong enough to take any type of creation. “It’s good to be able to put down five tonnes of cast iron and know the building won’t collapse” grins Antony Gormley.